Forecasting online trends is a tedious process. The Internet’s need to constantly evolve has made it difficult to determine what will succeed and for how long. What we have seen over the last few years is increased hardship in getting noticed. Online traffic is growing and the threat of oversaturating communication channels with advertisement is increasing. Growth in video channels and mobile platforms has led organisations to increase their marketing efforts in those areas. Becoming a recognised digital brand will lead you to adopt various marketing strategies. It’s not all bad news though. Metrics and measuring your site’s usage will become easier and more advanced in 2017. This development will assist in targeting the right audience as the rise in ad blockers has made it harder to reach them. Predictions for 2017 include increased digital disruption, targeting and multiple platform usage. So far we have seen growing traffic throughout mobile sites and high second screen usage. Mobile advertising accounting for 84 percent of Facebook’s 2016 fourth-quarter revenue. Fake news is one of the largest threats facing online users. Reports claim Google removed 1.7 billion news stories in 2016, twice as many as 2015. 30% of fake news online came from Facebook that advertising and tech companies are trying to fight this problem. Forrester Research recently predicted digital media expenses are expected to reach $118 billion by 2021. They also claim the rate of spending will slow as advertisers are opting for quality over quantity when it comes to their advertising campaigns. Enhancing the user experience is highlighted as the driving force here as brands are seeking to connect with their target audience. Large-volume advertisement is losing effectivity online and users are seeking more personalised content. Like previous years the emerging characteristics the web offers are still being developed. Growing fields such as SEO and live video streaming are becoming more organised. Young web users, who are digital natives, are coming of age and their spending habits change as they get jobs. Users who organisations have built relationships with throughout their childhood now have their own money. As this generation enters the marketplace your target audience may need to widen. Their high-spending habits already consist of $600 billion a year. One of Facebook’s newest features is the ability to live-stream yourself from anywhere. Facebook has shared is statistics for global live videos in 2016 with the top video gaining over 164 million views and 3.3 million shares. This channel is only emerging and is already proving wildly successful. There are various live streaming platforms on the web, choose one used by your target audience. Live streaming offers a new way to communicate your message giving you flexibility how, when and where you want to broadcast. Become familiar with the platforms and don’t let it pass you by this year. With ad blocking on the rise advertisers are expanding on more creative ways to reach their audience. They are offering more engaging ads utilising native advertisement. By creating ads that appear to be part of the website advertisers are attracting more attention from their audience. This also causes them to spend more time on a site. With over 400 Million users worldwide make use of this software, it can (and does) have a major impact on revenue. This gives you a chance to explore your advertising methods. Video and sponsored content are also options that are not affected by ad blocking and will continue to see growth this year. The abundance of data available online has recently seen a large volume in the number of users taking advantage if the technology. This trend is set to continue to grow in 2017. Analytics show what your customers are doing and what they think. This information will continue to become more accessible and more users will gain the skills and knowledge of how to use them. Not taking advantage of this technology in 2017 means you’re missing out. A simple view at a sites analytics reveal what is working and not working on a website. Throughout 2017 sites will become more engaging and appealing to users and analytics is the driving force behind this. 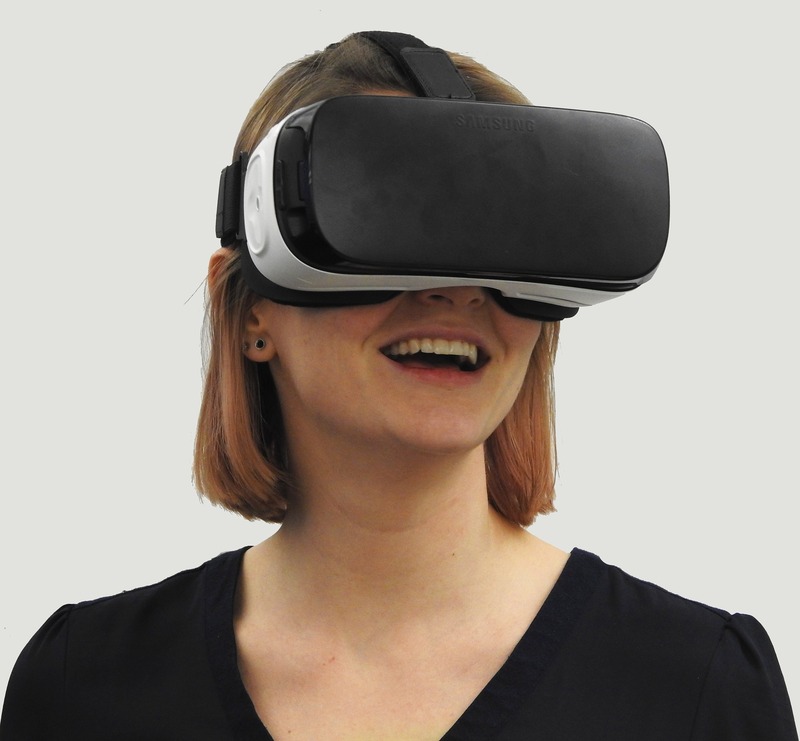 Virtual reality is a new platform emerging from the gaming world and into mainstream usage. This tool will enable marketers to reach audiences in a whole new way. The big companies behind developing the technology have some new releases for 2017 as investment in the industry grows. Human machine interaction is expected to grow as well. Marketing is set to become more personalised in 2017 and Artificial intelligence is predicted to a well. Their messages will become highly relevant as brands try to reach their target audiences. Marketers are yet to adopt this technology over claims that it is difficult to train people to use it and get results. Converting this technology into a tool marketers can use will take time but there will be many developments in 2017. In the field of SEO experts are still trying to understand how Google’s search engine works. Google constantly updates its search engine as they seek to get users the best results. Along with the growth in analytics and data there will be many more resources available online. The amount of skilled professionals in the industry will grow. This strategy will become essential for all businesses looking to make an impact online in 2017. Balancing SEO and the user experience will be one of the challenges for optimisers this year. Tracking all of the online spaces you own and presenting engaging content should be your priorities this year. Whether you are an individual or a business you will be affected by global trends. Adopting new technologies and getting in on the ground floor of new platforms is a must. Always seek to exhaust your creative routes and try to stand out. Targeting your audience correctly will remain a key factor as the volume of Internet usage is expected to continue to rise. This will also pose challenges in assessing the information you find online. Fake news is an emerging concern for large news corporations and social sites as they seek to eradicate it. 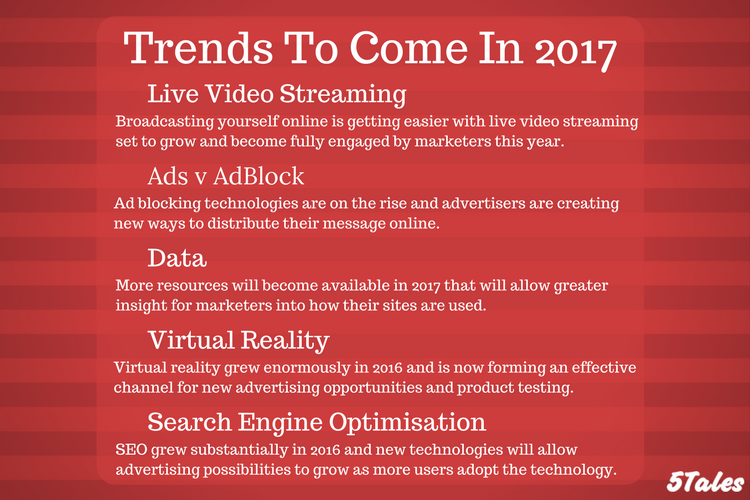 Mobile platforms, video channels and virtual reality emerged in recent years but will be valuable tools in 2017. Gaining a competitive edge is essential; 2017 is the time to expand your digital marketing efforts. The wearable smart device industry will continue to grow as users look for more as to engage with brands. For marketers these devices present a range of opportunities including GPS, advertising on-the-go and greater engagement. Virtual reality headsets, fitbits and the Apple Watch are some of the products already on the market. Integrating these gadgets into a marketing scheme is difficult but advertisers will start operating on these platforms this year. As more users build their connections with and spend time on social media platforms their trust increases. Markets are set to receive large volumes of business directed straight from social media sites. These free to use platforms are growing and in the case of Snapchat going public. Social media advertising may suffer as advertisers are creating designs with the intention to look indistinguishable to organic content in an effort to fight AdBlock. Lets just hope these platforms stay free.